I've let myself back into thrift stores, yard sales, and flea markets. 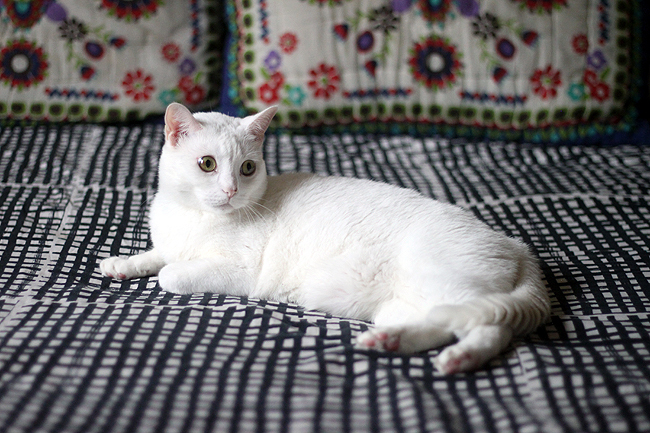 I took a break while I spent some time deep-purging and organizing my apartment. I don't need or want much else in my life, but I still keep an eye out for extra-special pieces to induct into the collection; exercising a one-thing-in/one-thing-out rule. I always try to peek at some yard sales/second-hand shops weekly for practical wares for home and business, too! This post shows some behind-the-scenes bits I scooped up throughout the month for free- or close to it! 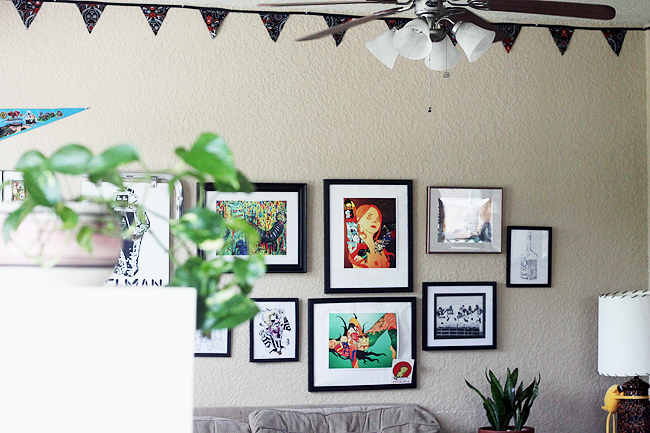 The bunting currently on my living room wall features an orange and red El Dia De Los Muertos themed fabric that goes perfectly with the artwork. I'll use the bunting for my market tent around October, but for now, it's a cute new addition the living room. I traded a kombucha SCOBY for it at a natural product swap. you can see other items I traded for here. I found these pretty recycled rainbow place matts and matching box at the Goodwill by-the-pound store. They make a nice color pop, but my real reason for buying them was to keep myself from piling tons of stuff on the table while I work and leave it like that! 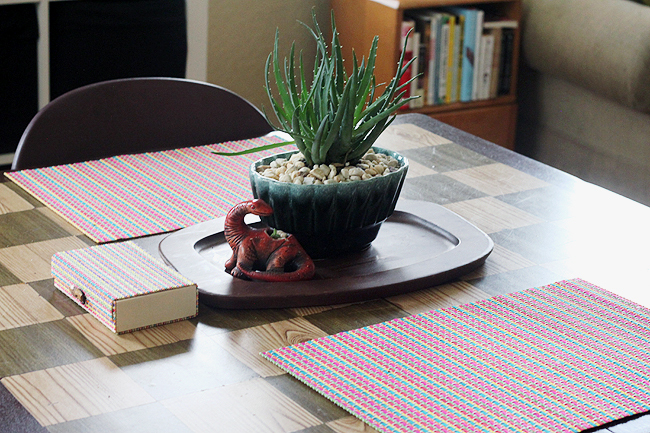 The matts establish the table as a spot to eat or take notes. So far, so good. I've stopped junking-up the table. Nearly all of my clothes is from Goodwill, yard sales, and random thrift stores or indie shops. I buy clothes that match my cool undertone in most cases. The fun thing about buying 2nd hand is that you can dye and/or sew/alter pieces without guilt because it's usually so cheap to procure. These are just a few favorite pieces I've scooped up for anywhere from $1.00 to $5.00 over the past couple of months. The little floral piece was slightly against my rules but the Urban Outfitter's 90s-through back piece got to me, my mom had very similar floral sheets. It was $1.00. The wrinkled blue dress line-dried like that, oops! Didn't have time to iron it before shooting it. I've one of two tote bags as my go-tos for years, even though everything constantly falls out of them! 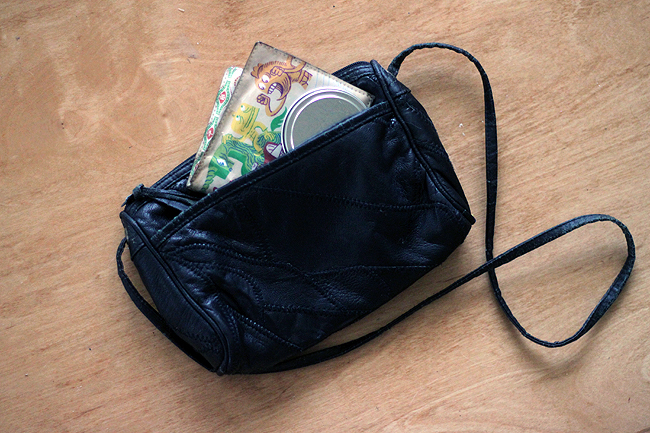 I started borrowing my roommate's little black purse to prevent further object loss, but I recently found my own for less than 50 cents! 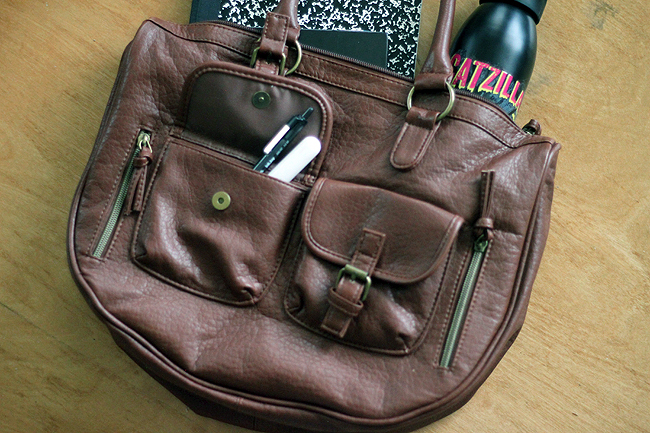 This basic brown bag was like-new and seemingly unused from Goodwill. It was more than I normally pay for anything, especially a purse ($5.00!) but I liked the shape, it's a beautiful basic piece. I've used the piece for product photography. The white guy poking out is an aromatherapy inhaler from my shop. 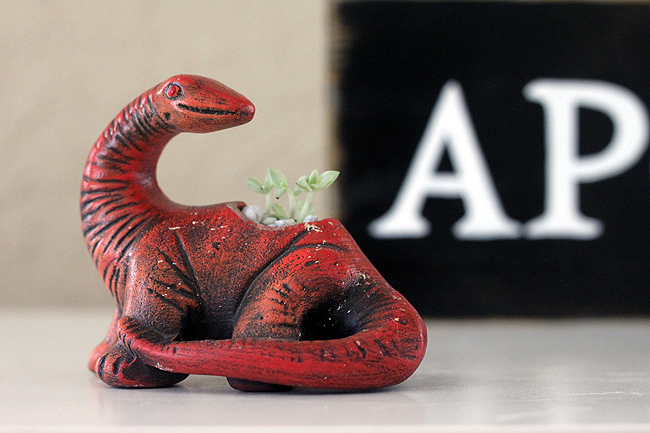 I reached for my fifty cents so fast when I saw this dinosaur planter at the flea market! I may fix the paint chips with a little red and black paint. It would look gorgeous with some glaze, too. It was the perfect size to host one the succulents I've been propagating. 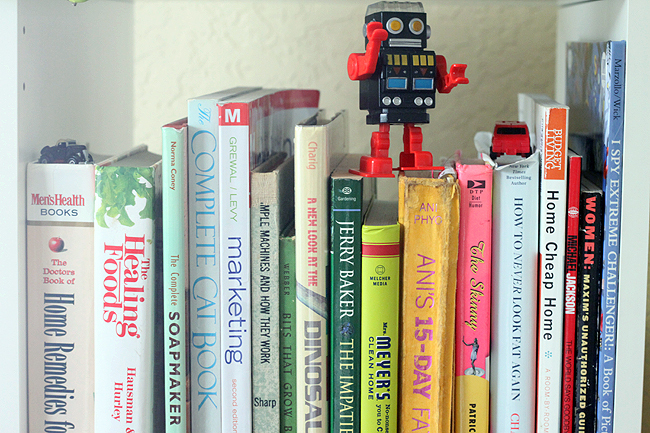 And books, hell yes, the books! I went to a library book sale recently where they had a fill-a-bag for 10 buck deal (and I believe a buy two get one free the last day.) I bought one bag stuffed with books on diet, herbalism, health, and a little art and kitsch for good measure. I can't wait to devour them all while taking notes and sipping herbal tea. I donated (or sold?) my last watering can, a gorgeous copper hued metal one. I've been watering my plants with a measuring cup but it disturbed to soil too much. 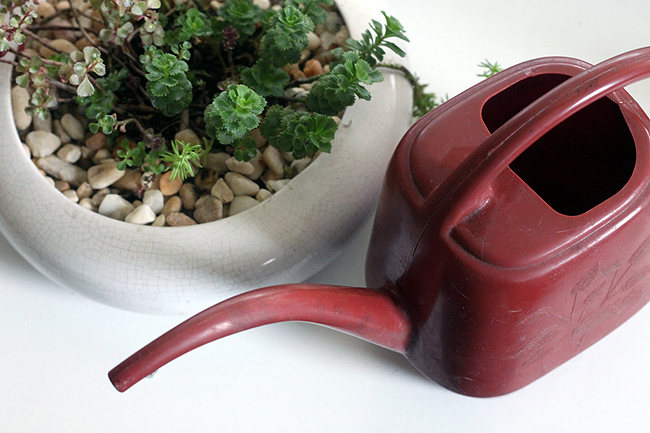 I scooped up this simply plastic watering can for a $1.00 to remedy the issue. 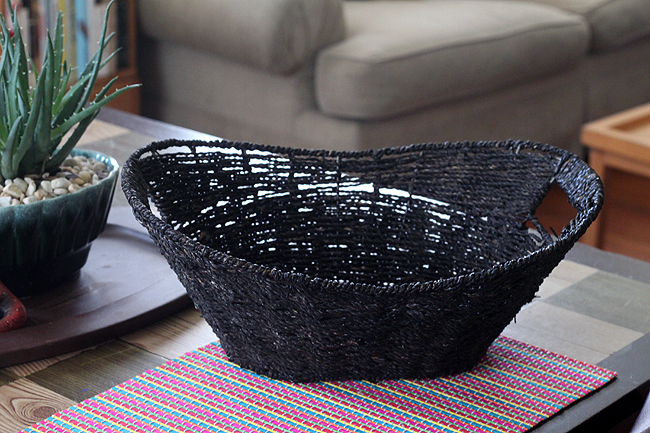 I already used this beautiful black basket for a recent organic/homemade product swap. It's reinforced with metal so it'll be the perfect practical display piece for outdoor markets. $1.00 from a yard sale. 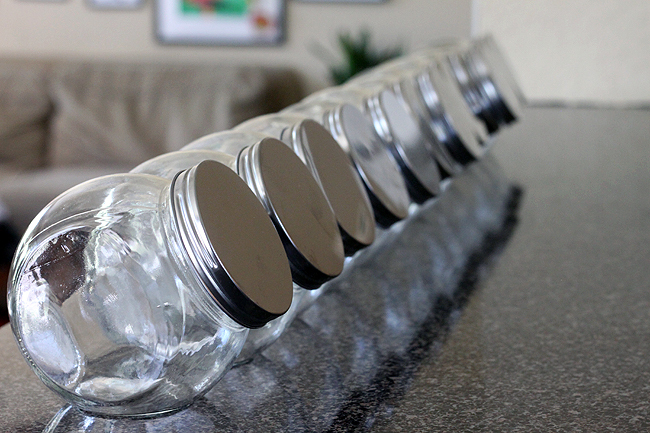 This set of 12 jars was $12.00 from a yard sale. Perfection! My herb cabinet is a giant mess, these beauties are perfect for storing my current stock of herbs. 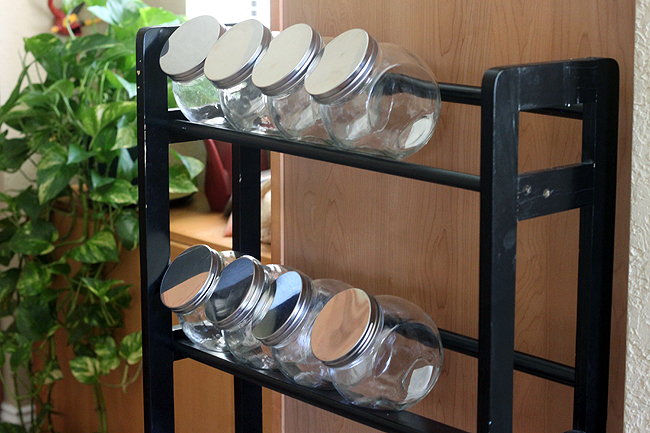 The jars were the perfect fit for a shelf I rescued from someone's curbside recently. I just finished turning it into my home apothecary with herbs and bulks, I'll have to update with an "after" photo later! I found something for perfecting posture for long hours spent on the computer for fifty cents, score! On that same practical note, I scored a free crock-pot and two immersion blenders for close-to-free, both I'll use for making soap. 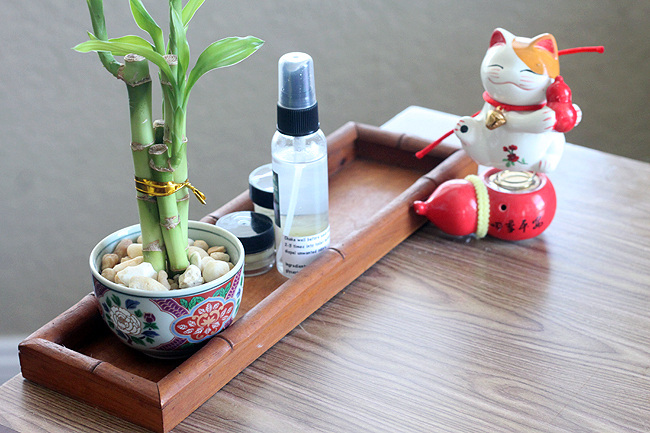 I scoop up nice little trays any time I see them for cheap, this little one was perfect for holding aromatherapy goodies and my little bamboo plant on my desk. 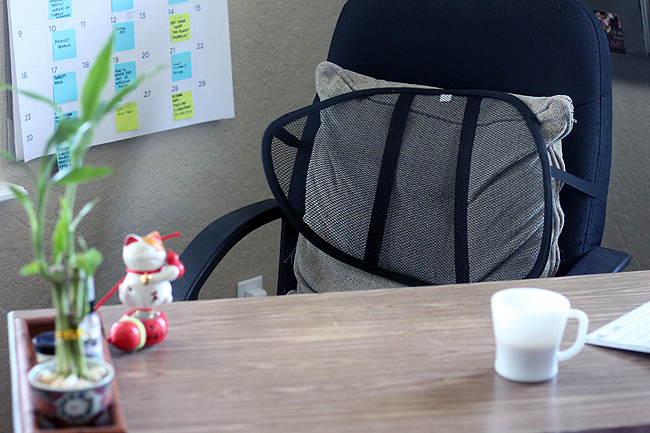 And The Yuko-chan is still following my around, jumping in my shots and/or watching me work when she's not sleeping off a food coma. Have you been hunting at the thrifts/flea markets/etc. 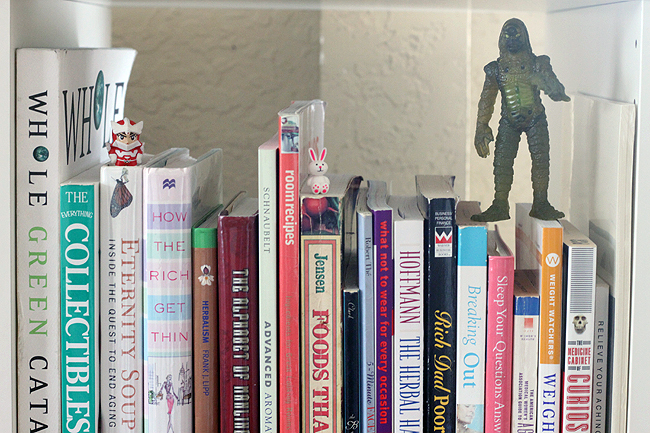 for practical wares, merch or fun lately? It's been fun to get back to the hunt in small increments. Follow Vanessa Alvarado via Instagram, Twitter and Facebook for daily updates! Thanks Duni :) I'm proud of my Spaniard last name. Yep, still thrifting in little bits. 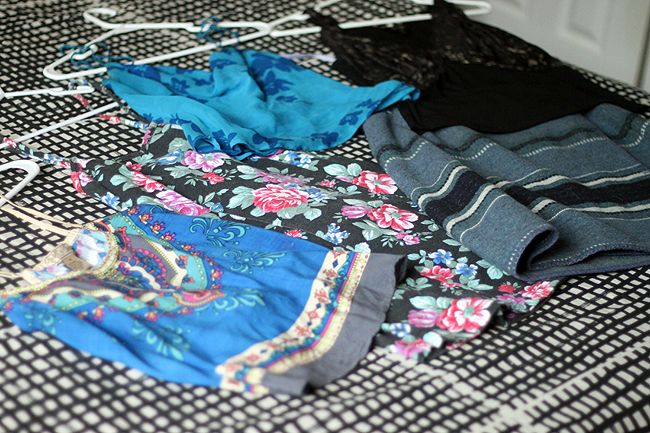 I want to collect more vintage clothes especially, always on the prowl for special pieces :) Thanks for the kind words! I am in the same boat. I'm realizing that what I actually wear (vs what just sits around) is usually new retail so I'm trying to cut back on resale unless it fills a void that I've already identified. Such a bummer. I love thrifting for household stuff though. 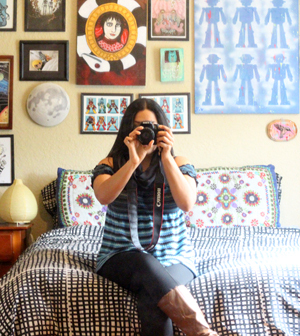 I added the new address to Bloglovin'. Só happy you are back in your thrift aventures because I always love what you bring home. I have been pretty interested in organic products and I can't wait to find the time to learn more. A preview of the body care products is here: https://www.etsy.com/shop/BodyCore The photos and descriptions will change to the professional ones as soon as I can, having some technical difficulties getting the labels done. :) I will have extensive information about organic/natural products from my schooling on the blog in the months to come. Congrats Van (I will always think of you as Van :)) on the new .com. And on thrifting again woohoo! Oh oops, the profile name still said Van, just noticed that. Weirdly enough (to me, anyway), most other publications I've written for wanted "Vanessa" or the full name for the by-line and not Van or Thrift Core. That dinosaur planter looks cool! congratulations on your new site Vanessa! Same here with quirky planters/vases. I'm propagating plant children so they really come in handy. You are the thrift queen! I love seeing your finds. 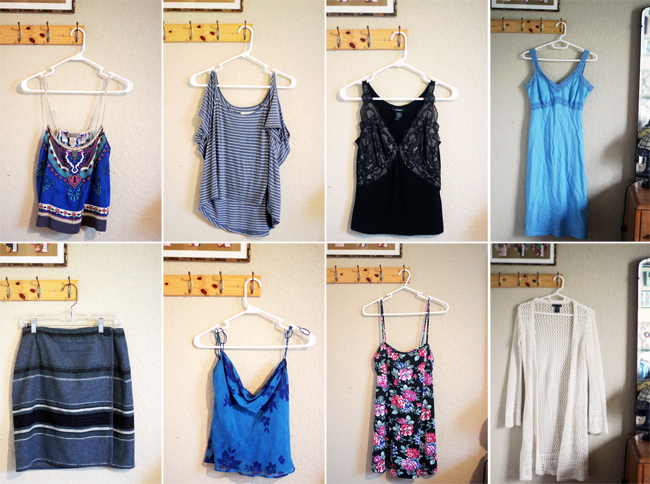 I've gotten so many amazing clothes from thrift stores over the years. Honestly, I almost never buy retail anymore! Yep, my go-to is a thrift store first. I try to avoid retail unless absolutely necessary. From your recent fruit post; "Whereas here in the US, the fruit is picked un-ripe and never gets to ripen as fully as it would if you let it stay on the tree longer." You are SO GOOD at making blanket statements that are NOT true! Whether it's about the cheapness of a raw/vegan life or other untrue nutrition statements or the blanket statement above. It's just not true. SOME fruit might be picked before it's ripe and SOME fruit is not, but certainly not ALL fruit in the ENTIRETY of the U.S. (which includes Hawai'i, in case you've forgotten) is picked before fully ripening. Further more, FRUIT RIPENS OFF THE PLANT. Fruit doesn't need to stay on the plant to fully ripen. You can pick it early and it will continue to ripen into being sweeter. And even in your precious Puerto Rico, plantains are sometimes picked early because fruit has different cooking properties depending on how ripe or unripe it is. You should just stop trying to be the queen of nutrition because you're only ever half right and so often more than half wrong. 1) Absolutely not trying to become the "Queen of Nutrition". It's something I'm going to school for, learning about daily, and experimenting with daily, but if I seem like I'm trying to position myself as an expert, that's an accident. I write about it a lot because I write about my life and right now the study of it is a big part of my life as I finish school. 2) What's with the anger here, Fenna? If I'm wrong, you can tell me I'm wrong without being vicious or outright insulting. 3) Yes, fruit ripens off the plant. Some only ripen after picking, some should be picked when ripe, which ones do which is sometimes debated. 4) My Precious Puerto Rico? What kind of statement is that? You're sounding unnecessarily angry and condescending here for me just writing about a place that I love and things I love to consume while I'm there. Congrats on the blog name change! It's difficult for me to ever pass a thrift shop without taking a peak inside...but I'm always looking for inventory to resell, but oftentimes come home with lots of goodies for home. Especially clothes for us..with 3 kids, 2nd hand is the best! Saving money for more important things!